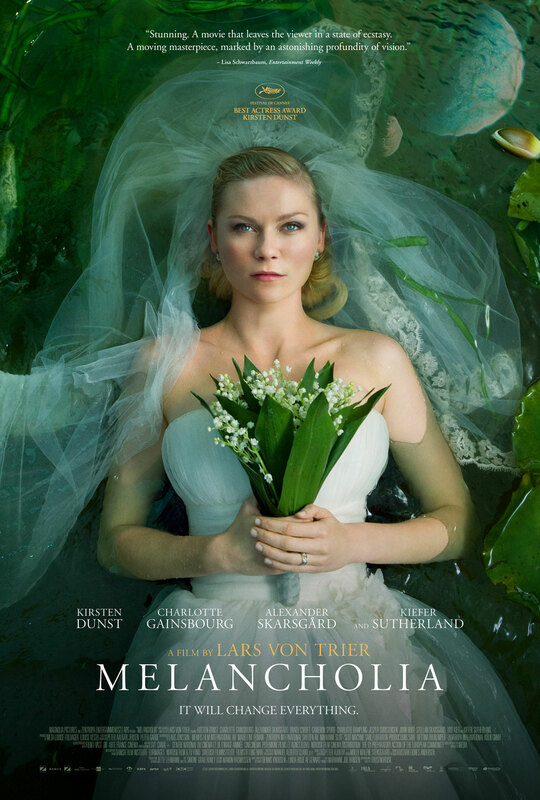 "Melancholia" is my first venture into Lars Von Trier-land and with all that has been said about him and his previous films I tried to separate his reputation from his work. He is a director who clearly likes to stir the pot and ask people to talk about him which in turn makes his films all the more intriguing. I didn't want that image of him hanging over the film though. The trailer was completely enthralling, it offered beautiful imagery with the most personal of apocalyptic stories at its heart. Much like Terrance Malick's "Tree of Life" I wanted this film to be an experience and Von Trier has indeed created a film so moody, so full of a wide range of emotions that you easily become invested in its cast of characters. We sit, for just over two hours and study these creatures as they face serious personal issues and depressions that are embodied and put into perspective as a planet, once hidden by the sun, comes hurtling toward earth. It is a strange film, one you will indeed need to have patience with and a certain degree of academic-like thinking to really find it worthy of discussing. "Melancholia" is in all its grand exquisiteness, a sci-fi film with a heavy heart that is just as interesting to talk about as it is to view. Skarsgard) enjoying wedded bliss before all goes down hill. While it is true that the story consists of this mysterious new planet and its unavoidable crash course with earth, the film is really based around the relationship of two sisters. Von Trier breaks the film into two parts, the first focusing on Kirsten Dunst's Justine. The film opens with Justine and her new husband Michael (Alexander Skarsgard) on their way to their lavish wedding reception. It is in these opening moments we glimpse a happy and content Justine. As her and Michael try to help their limo driver maneuver around a corner we not only have our first impression of these characters but for the actual tone of the film. It is an intimate portrait of a special moment that is soon to be overshadowed by Justine's drastic mood swings. Von Trier's point here is to show the heavy weight of depression and sadness that is clearly putting immense amounts of pressure on Justine's mind and body. As Justine suffers through her darkest days we are never really given any indication as to what caused this or why she feels the way she does, we just see her suffering. It is sometimes hard to watch as this emotional kind of chaos just takes over her life. She seems to try and find strength only for her supportive sister Claire. Claire is the focus of part two. She is very much the opposite of her sister. Like the earth she is a force standing in the way of Justine's melancholy mood. what he knows of impending doom. Claire, as played by Charlotte Gainsbourg (who won the same best actress award at the Cannes film festival for her work in Von Trier's last film "Antichrist" as Dunst won for this film) was, for me, actually the more affecting of the two sisters. Don't get me wrong, Dunst turns in a very moving and desperate performance. Dunst herself suffered through bouts of depression and we can see her reaching back to how she felt in those times and applying them to Justine, but as Claire, Gainsbourg is the solid rock on which the film stands. 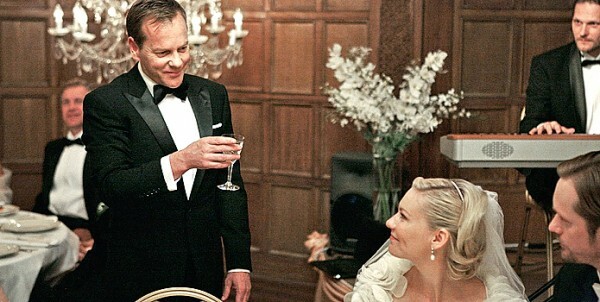 She is protective, and she along with her astronomer husband (a subtle Kiefer Sutherland) give everything to make sure Justine is happy. As we watch the roles reverse though as Melancholia, the planet, draws closer and closer to earth it is easy to see some of ourselves in Claire. In writing through that process though it comes to me that it most likely just depends on the type of person, the type of viewer you are that depends what character you feel more connected with. I easily became irritated with Justine and didn't enjoy the way she seemed to take for granted all that others did for her, that she could feel so depressed when actually being more blessed than most. It is Claire who has earned her spot in society (even if she married into it) and continues to be selfless and put others before her whether it be her child, her husband or her sister. a moment in the garden as the atmosphere changes. "Melancholia" is stimulating if not as ultimately moving as Von Trier would have seemed to hope it would be. It is a striking film though, in every aspect, and deserves to be meditated over and discussed with other film lovers. One aspect of the film I have not addressed is the opening montage of beautiful images set to the sweeping sounds of the famous prelude from "Tristan und Isolde". They show us our characters and their reactions, their physical actions, their mind sets as the end of the world is actually approaching and there is literally nothing you can do to escape the impending doom. It is a perfect metaphor for what we are about to experience through Justine in the way that she is so broken, so fragile in her doom filled eyes and in Claire and how she feels the need to be responsible for everyone and everything until the moment when she has no control and can do nothing but to face death with uncertain fear. One may not understand all that happens in the film or what reason we are given such a lush family backdrop for the girls other than to see the nature vs. nurture debate fight it out between Justine and Claire. It is a complex, yet simply paced film that takes us on a much bigger journey than it's surface implies. It is a film Von Trier can be proud of and one that doesn't allow his own psychological missteps to influence our reaction. It is a movie all its own, a fine experience at the cinema.